Here at Polka Dot Design, we encourage you to incorporate your own personality into everything you design. 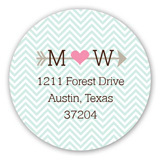 This is why our custom address labels are such a popular choice! At times, correspondence can be such an informal thing, and with customized labels, you can jazz up outgoing mail, all while adding a bit of flare into the mix. 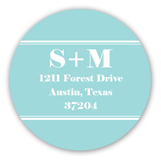 Take our wedding address labels, for example, a popular item for many newly hitched couples. Are you looking to integrate some of your own character into your outgoing announcements? Look no further. We feature some of the best moving announcements and new address announcements in the business. All you need to do is customize the announcement to your liking with a few simple clicks of the mouse. Then voila, you can check another item off your moving to-do list. 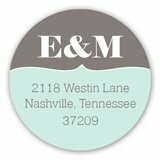 Choose the color for your return address labels. You can do this in our design studio with our address design. Our site offers return labels for your envelopes. 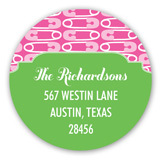 Make your wedding stationery cute with our labels designs. 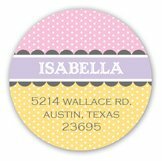 Choose to use these stickers to add your return address to your custom thank you cards. Order all of this from our stationery store online. We also feature a large collection of other completely customizable items. For example, our kids stationery, which are a great way to encourage your children to stay in touch with relatives and friends, all while making the writing process fun. Or our personalized baby thank you cards, which allow new parents the opportunity to send well-wishes of gratitude after the birth of their bundle of joy. No matter the occasion, Polka Dot Design will have you covered every step of the way. 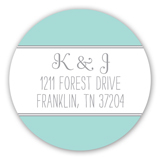 Save up to 20% or free shipping on custom address labels online at Polka Dot Invitations. For more information, contact us at service@polkadotdesign.com or call the Polka Dot hotline 1-877-816-0884.